For the last few years, one of the most prized possessions in our pantry has been a gigantic bottle of imported Mexican vanilla extract. It’s not that imitation stuff that you get on sale at the store, with weak vanilla flavor and added sweetener. This stuff is pure unsweetened vanilla extract. It makes pies and cookies and homemade ice cream and sweetbreads and cakes and countless other things we make at home sublime. A month or so ago, I noticed that our big bottle was finally running low. We decided to stop by an ethnic grocery to look for some replacement, but just as that conversation was happening in our home, our old friend Carrie posted about her experience making homemade vanilla extract. It turns out that it’s pretty simple. 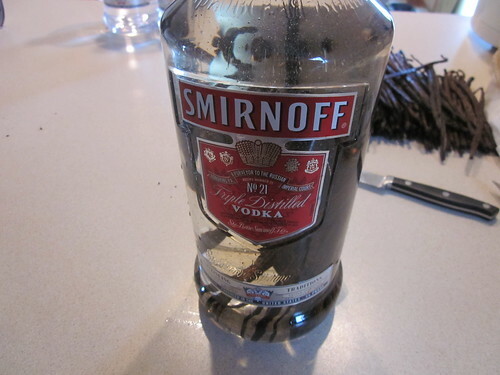 Get some decent vodka (not the cheap stuff that often has impurities), some vanilla beans, slice open the vanilla beans, and toss them in the vodka bottles. Store, shake about once a week, and in a few months, you’ll have amazing homemade vanilla extract. Even better, if you can find some small bottles, you can easily give this homemade extract away as gifts to your friends who bake things in their own kitchen. 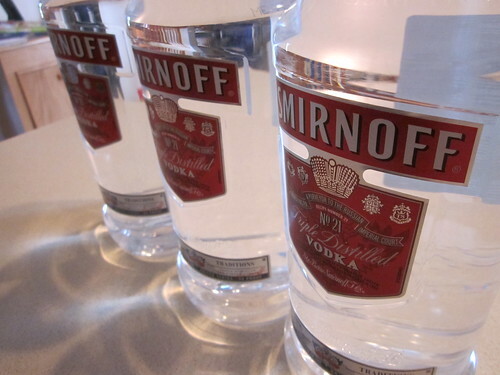 After some hunting, I found a great bargain on 3 1.75 liter bottles of Smirnoff (since you need to use at least a mid-level vodka – you can also use rum, if you’d like). I paid $12 per 1.75 liters of it – about 7.4 cups. 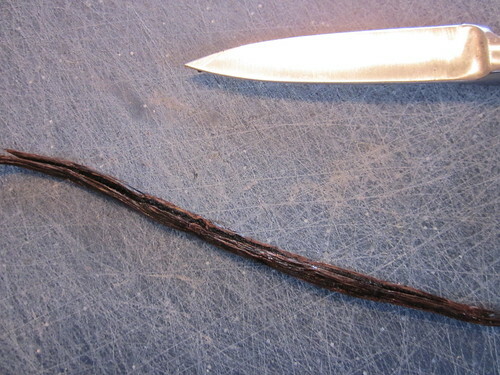 Considering that a cup of vanilla extract will last quite a while, we’ll be making a lot of extract. The challenge, however, was finding the beans. Our local grocery store wanted $5 per bean pod for organic vanilla beans. Considering you’re supposed to use a few bean pods per cup of extract you want to make, that adds up fast, making this seem prohibitively expensive. Carrie found a better deal – she was able to pick them up for $0.79 a pop at her local co-op. Still, not inexpensive enough. So I went online and checked out every website I could find about making homemade vanilla extract. After sending a few emails, multiple people suggested that I check out Vanilla Products USA, which sells vanilla beans on eBay and has a 100% buyer feedback rating. I bought a pound of beans from them, shipped to me for $24.99. They threw an extra quarter pound of beans into the package for me. 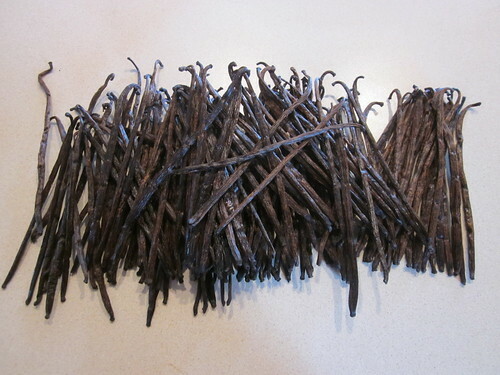 What does a pound of vanilla bean pods look like? A pound of these beans totaled about 160 pods, so we actually bought 200 pods for $24.99 – about 12 1/2 cents a pod. So, our cost per cup of the raw ingredients for the extract is about $0.38 for three pods, plus $1.75 for the vodka, making a cup of this extract cost just a smidge over $2. Since a good extract is used only a teaspoon at a time, the cost per use of this extract is about four cents. Sarah and I took turns cutting the beans. We would take a bean, slice it lengthwise (as seen in the picture), and tear it into two halves. 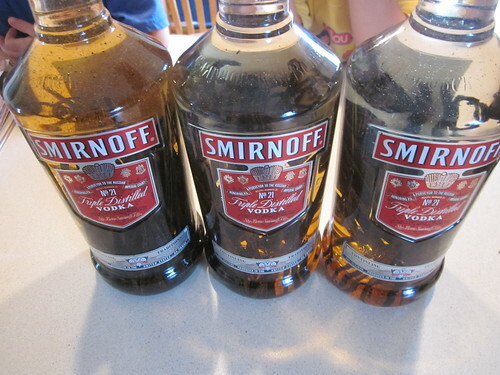 Then, we’d plunk both halves into the vodka bottle. One (obvious, in retrospect) thing we discovered is that the beans add volume to the bottle. The solution is easy – pour off about a cup of the liquid before you begin adding beans, then fill up the bottle after you’re done adding the beans. We added different amounts of beans to each bottle, just to experiment. Based on the materials I’ve read about vanilla extract, there won’t be an enormous strength difference between the bottles of extract. Once we have our beans in the bottles, we just seal ’em, shake ’em vigorously for a minute or so, and then put them in a cool, dry place. After that, shake the bottle(s) once a week or so and you’ll have usable extract in a month, though most sites encourage at least two months of extraction and as many as six months is sometimes encouraged. As you can see, the vanilla extraction has begun! The bottle on the left is after only an hour of extraction and you can already see the browning of the liquid. Each week, shake the bottle to keep the extract going. We marked it on the calendar, actually, to remind ourselves. When the extraction is done (we’re shooting for about December 15), pour out the extract and filter out the beans, the pods, and other particulate matter. A few coffee filters should do the trick wonderfully. From there, you can put the extract back into the bottle or into other containers as per your desire. For gift giving, we’re going to give the extract in small glass bottles with lids (we’re looking for ones that will hold a cup, or eight ounces). Since we know that we’re going to need these but we have time to search for them, so we can put our bargain-hunting skills to the test. At the end of the series, we’ll show you our final product (with some home-designed labels). Next week, we’re going to talk about a homemade item that’s going to have a gigantic “WARNING! DANGEROUS!” label at the top of the post describing it.